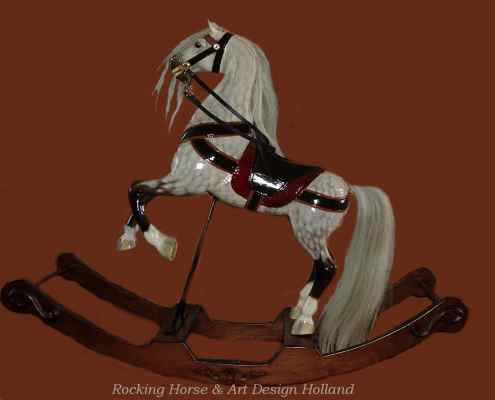 Our rocking horses are created for people who want something completely different. 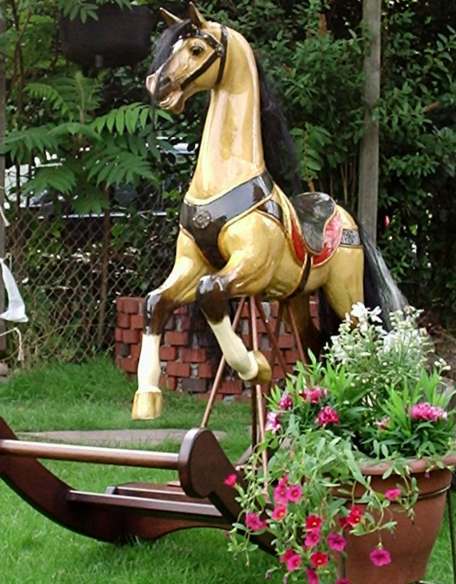 We are designers of unique, exclusive wooden horses, made for decoration purposes, which you will not find elsewhere and do not stick to the conventional markings, painting patterns and design, but try to make out of each rocking horse a 'one of a kind' piece of art: an individual with a personality. 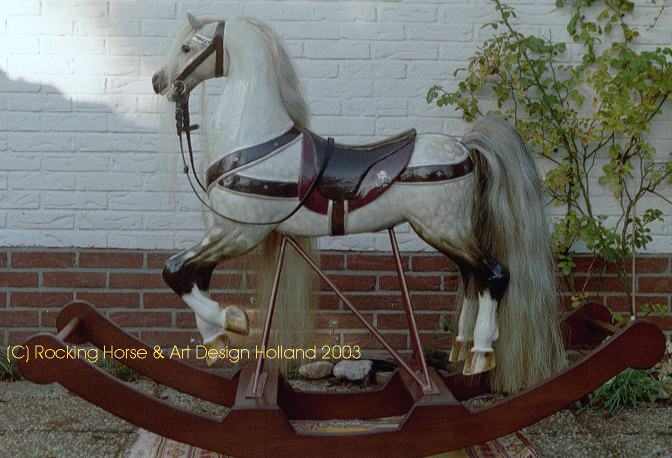 If you are looking for a unique, high quality rocking horse with a close match to your dream-horse or own favourite horse or pony, we can carve and paint your new rocking horse in the closest way you want to have it. According to your wishes -but without losing our identity- we can make a top collectible and ornamental piece of art. 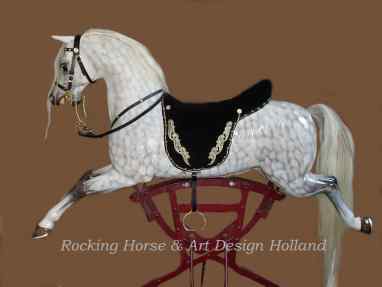 There are a lot of possibilities; For example choose your own color, color of the tail and manes, tack, bit, stirrups or a particular decoration. 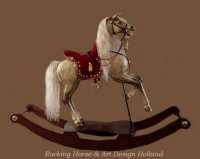 Even if you want a horse in 'Picasso'-design or a horse what appears to be made out of marble; there are always possibilities! 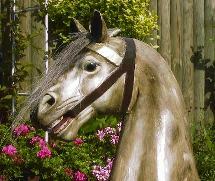 We create each horse individually and make only a few, unique -one of a kind- animals pro year. In our, only handcrafted, studio we handle our horses with the atmost care and attention. 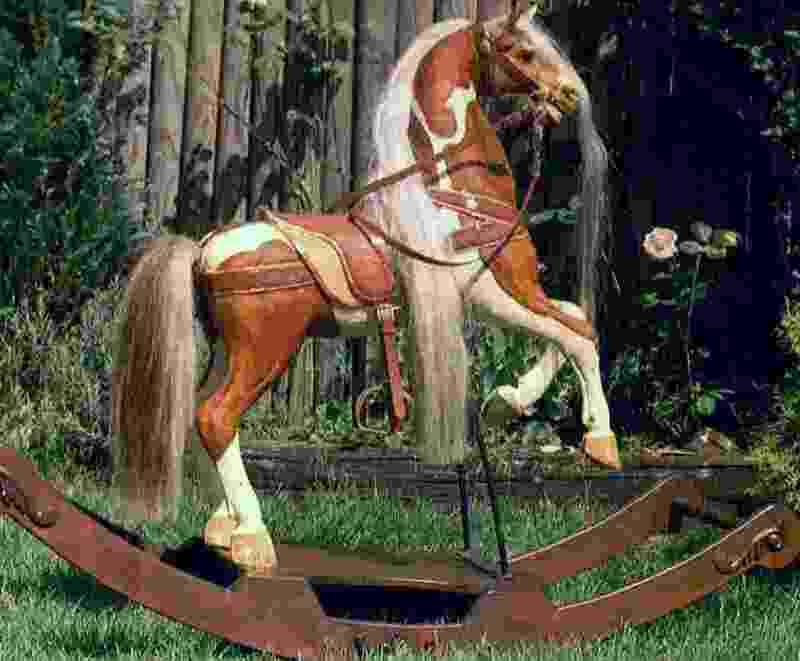 Every horse is made and tested to the latest EU regulations. 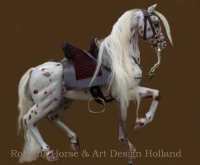 Once the horse is ready, you get a unique horse and one of the finest pieces of art! The horses below are only a port folio of horses we made in the past. 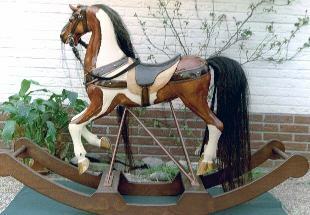 Our wooden horses are unique decoration.pieces. 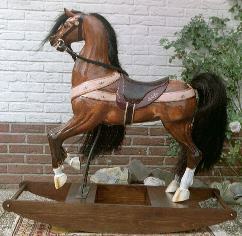 Below you will find other examples of horses we made in the past. Extra carved saddle and saddlecloth. 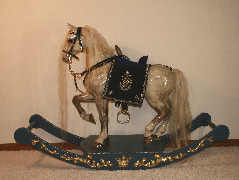 Solid brass, original, horse-decorations on horse and bow or stand. 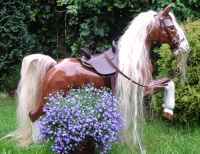 Our own exclusive reining bit with double or single reins, matching stirrups and blanket complete these horses. 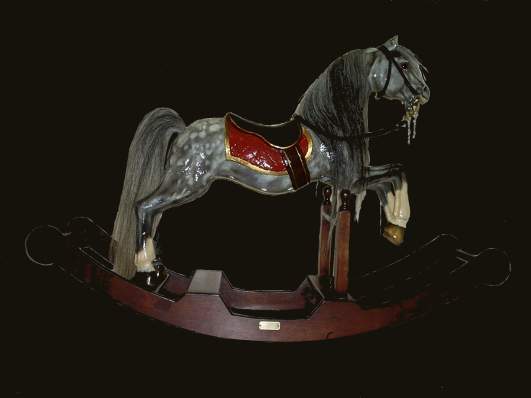 Most of our horses can be displayed as a rocking horse and as a carousel horse. To meet your decoration wishes the bow can be unscrewd. Click on the horses for more details. 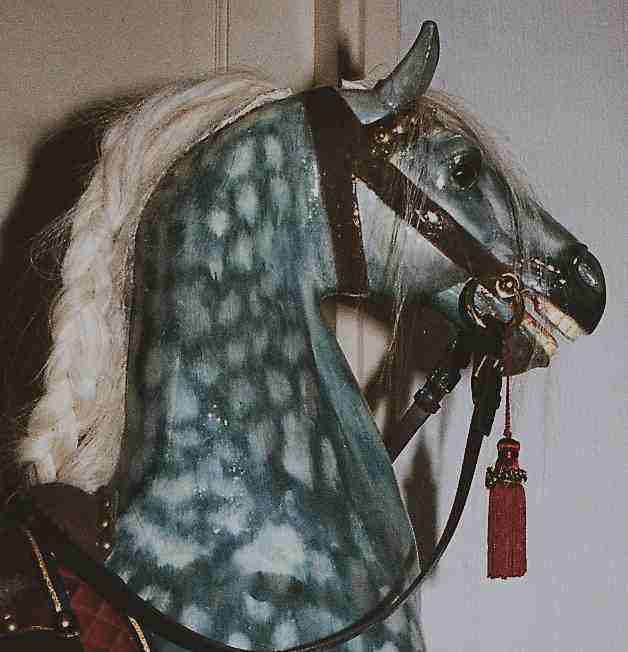 The hair on our rocking horses is made from real, solid horse-hide. We don't dye it, because this would affect the natural, subtle variations of colour as opposed to a mass product. 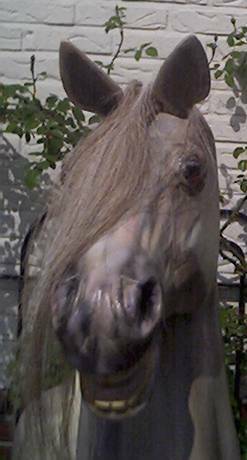 We use only real horse hair for manes and tails, ensuring a natural and very lifely, realistic appearance. 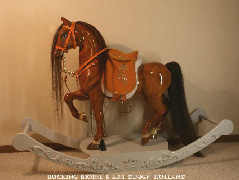 All our own made horses are our exclusive design and only for sale at this website. We design the unique models of our horses, produce the rough shapes and finish them at our studio in the Netherlands..
We use different kinds of wood. It is also our objective to protect nature and the environment. So we only use wood from firms who's plan it is to achieve this in the best possible ways. 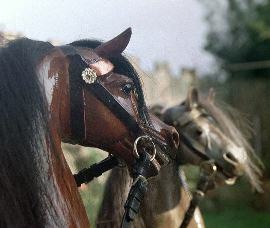 We often receive letters and emails from parents, grandparents and collectioners who bought horses in the past. Some of them became real 'family'-friends. We always like to hear how our horses are behaving in another stable! 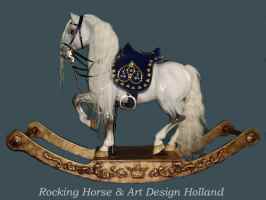 You can read some impressions after receiving our horses at our page 'ordering' or the horses which has been sold. We advise that children, especially those under 4 years should be supervised. 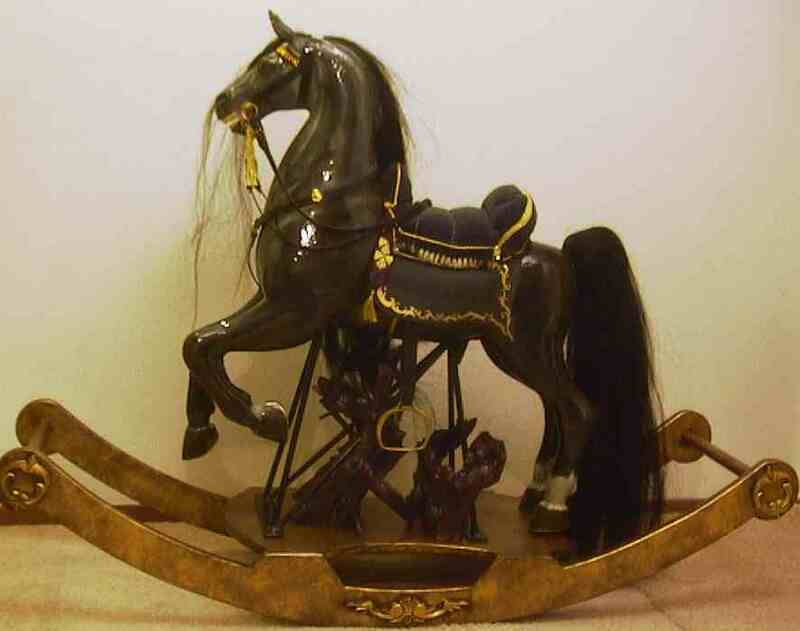 A rocking horse or carousel horse on stand or bow is large, heavy and has many moving parts. Always "beware!". Keep safety in mind.